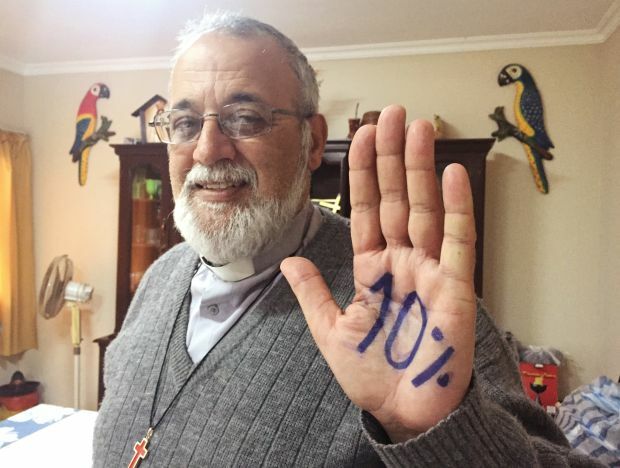 The priest, who previously worked under Pope Francis in the Archdiocese of Buenos Aires, also plans to pass out paper hands on sticks for people to wave, showing the same slogan, “10 percent” — the portion of the Bolivian budget he says should be spent on health care. His protests have been prominent in Bolivia and include monthly demonstrations, a petition with thousands of signatures and a June march in the administrative capital, La Paz. After the march, a government official said, “He wants to kill people,” since, the official said, health spending already accounts for 11.5 percent of the budget, not less than 5 percent, as Father Bautista insists. Padre Mateo, as the Spanish-born Father Bautista is better known, has become a cause celebre for critics of President Evo Morales, and there are many in Santa Cruz, a booming lowlands city often at odds with the government in the more indigenous altiplano. But the priest butting heads with the government again shows the strife in the church-state relationship: Church leaders are cast as the chief critics and opposition to Morales, the country’s first indigenous president. Catholic officials and observers expressed hope the pope’s July 8-10 visit to Bolivia offers the opportunity to turn the page on nearly 10 years of mutual suspicions, public criticisms and the church losing its previously privileged position in a newly approved constitution. Pope Francis’ visit could prove more political than pastoral, though church officials and observers say relations started thawing somewhat with the election of Pope Francis in March 2013. Morales traveled to World Youth Day in neighboring Brazil that year to meet the pope and later made trips to the Vatican. “With this pope, Evo feels very comfortable,” Father Albo said, adding Pope Francis gave the president a book on Liberation Theology and explained the idea of “structural sins.” At the previous meeting in Brazil, Morales told the pope, “I pray for you,” according to Father Albo. Relations were not always so promising, especially after Morales and his Movement Toward Socialism party took office in 2006. Morales won power on a platform of providing a better deal for indigenous peoples and doing away with colonialism and neo-liberalism. Suspicions surfaced, however. Morales and his ministers advanced Andean religious customs, attacked church privileges and quarreled with prelates, especially Cardinal Julio Terrazas Sandoval, now retired archbishop of Santa Cruz. The cardinal, who has been beset by health issues but will host Pope Francis in his home, denounced Morales’ persecution of political opponents and way of doing politics. A spokesman for the Movement Toward Socialism said the bad blood was the product of the church meddling in political matters, not anti-Catholic attitudes. Some in the church take a longer view of history and point to problems with prior Bolivian presidents, who expressed unhappiness with priests’ public positions — which included denunciations of military rule. The church has played a historically important role in Bolivia by providing health care and education in areas the state has been unable or unwilling to do so. Bishop Scarpellini said the church has signed “more than 1,500” agreements to provide social services. A new constitution approved in 2009 declared Bolivia a lay state and led to church suspicions its role in education and health would be reduced and that the government wanted to supplant Catholicism with Andean religious customs. “The idea of Evo wanting to destroy the church and revitalize these indigenous religions … this goes away because of this (papal) trip,” said Rafael Archondo, director of Jesuit-run Agencia de Noticias Fides news service. Some signs of improved relations are already showing. The church and government jointly organized the papal visit. Morales attended a meeting of the Bolivian bishops’ conference earlier this year and received a standing ovation. It was the first formal meeting between church and government officials in “five or six years,” Bishop Scarpellini said.